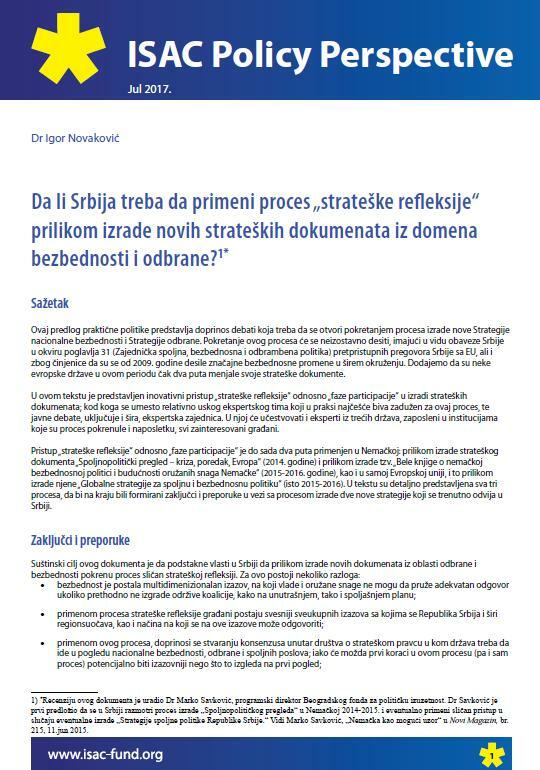 \Policy Opinions and Policy Perspectives\Should Serbia apply the process of “strategic reflection” in compiling its new strategic documents in the area of security and defense? Should Serbia apply the process of “strategic reflection” in compiling its new strategic documents in the area of security and defense? This practical policy proposal is a contribution to a debate that should begin once the process of compiling a new national security strategy and a new defense strategy is initiated. It presents an innovative approach of “strategic reflection”, i.e. “participation stages” in preparing strategic documents, which calls for the inclusion of a wider, expert community in the process, instead of the habitual, relatively narrow expert team tasked with the job.